The new collection of Ermanno Scervino represents a stylish white cropped jacket for young girl. Cool summer evenings sometimes may require putting on a jacket, as weather usually changeable, even in summer time. but the brand has a nice design, which will suit to a lovely skirt or a dress. The item is made from denim fabric. There are two small pockets placed on the chest. Brisk beads and pearls embroider and come along the upper pockets. The jacket has long sleeves. It can be fastened with front silver buttons. Accessories play an important role in creating a remarkable look of a young girl. It is possible to achieve a bright appearance with brisk bracelets, chains, bags and head accessories. The last ones are the most popular among young girl; and they really look fantastic. Choose this interesting hair band by Loredana Le Bellissime and get an adoration of others. It is covered with chiffon; a lovely peach colored flower is embroidered with diamante crystals on the top. This kind of bands is used for a daily causal style. T-shirts can be worn with any kind of bottoms: jeans, cotton trousers, shorts and skirts. It is a very universal top. And young girls also like combining and making different looks using classic T-shirts. 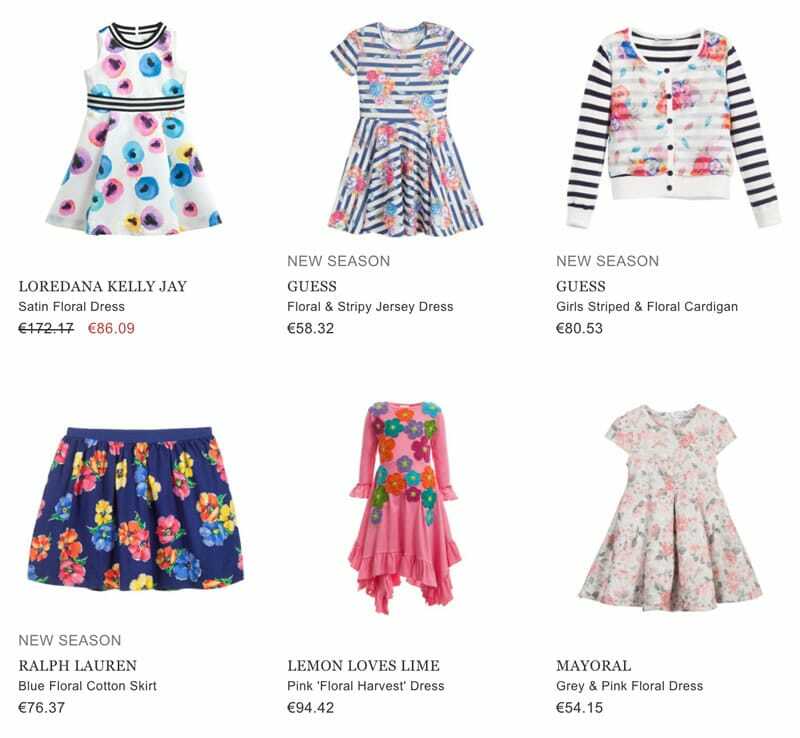 A nice option by Sonia Rykiel Enfant is offered this summer. The item is of white color but beautifully embroidered with a lettering “Rykiel”, which reflects the name of the brand. The hem is trimmed; and the short sleeves are rowed. The T-shirt can be nicely accompanied with a lovely head accessory. Floaty skirts are adored by girls; they add volume to a small shape of a young lady. They may be of different length and color, as this one by SuperTrash Girls. It combined shades from white to bright green starting from top to bottom. A nice elasticated waist is very comfort for wearing and is able to create a good fitting on body. A soft cotton lining is covered with tulle layer. A nice white blouse or a bright T-shirt will complete the whole summer look. The new must-have of this season is these bright trainers by Billieblush. Though it is very stylish to wear girlish sandals and flip-flops during summer, trainers are an essential item for sure. they suit more to a sportive style, but the fashion says that now it is very nice to put them on both with jeans and lovely skirts. The shoes are of pale pink color with glittering sliver details. The both sides of them are embroidered with studs. The trainers have bright orange lace for fastening. If going for a walk or picnic, don’t forget about packing all your things and stuff in a comfortable bag for carrying it with you. This interesting shape and floral designs of a rucksack by Cakewalk is full of summer colors. The backpack is embroidered with pink, red, orange, yellow flowers all over. There are adjustable shoulder straps and one handle on top. One large compartment is able to contain all necessary things.